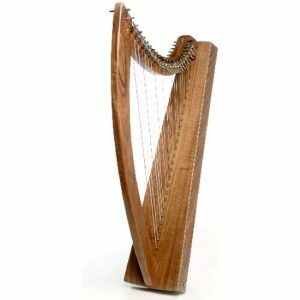 Made by Noteworthy Harps (Ohio, U.S.A.), in cherrywood and part-levered with Loveland levers (C,F,B). Comes with tuning key & bag. 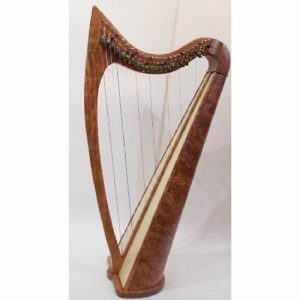 Typical of all Jeff Gaynor’s cherrywood harps, this harp has a wonderfully sweet tone with excellent sustain. Height: 33” Weight: 6½ lb Tuned from ‘C3’ (‘C’ below middle C) up to ‘E6’. * Minimum rental period 12 months paid in advance. 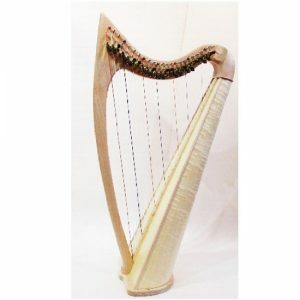 Made by Noteworthy Harps (Ohio, U.S.A.), in curly maple and fully levered with Loveland levers. Comes with tuning key & bag. This harp has a bright tone with good volume and excellent sustain. 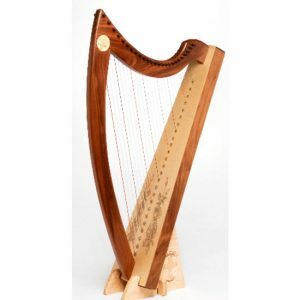 Made by Triplett Harps (California, U.S.A.) in cherry wood, walnut, maple or bubinga wood complete with full set of Camac levers. Comes with strap, lap bar, tuning key and high quality fleece-lined padded case. The Christina delivers a very full sound for its size, and in our opinion, is one of the most beautiful sounding and prestigious healing harps to be found anywhere in the world. the very best therapy harp that money can buy. Height: 34” Weight: 7 lb Tuned from ‘C’ below middle ‘C’ up to ‘F’. Never before has there been an instrument that so easily lends itself to such a wide variety of therapeutic situations. Designed and invented by Musicmakers in Stillwater, MN in collaboration with Australian music thanatologist Peter Roberts, the Reverie Harp is fast becoming a must-have tool for music therapists, visitation ministers/chaplains, activity directors, and nursing homes care-givers. Music therapy that patients can participate in. This wonderful instrument is smooth and comfortable to hold, and it weighs only about 4 lbs (1.8kg). Best of all, it produces heavenly sounds no matter how you play it. 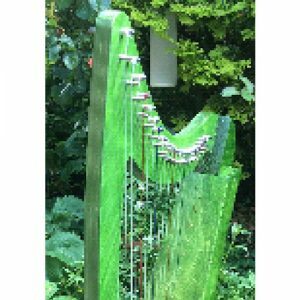 What makes the Reverie Harp so therapeutic? The strings are tuned to a pentatonic (5-note) scale in which all notes harmonise. That means instant success, even for non-musicians. You can literally place this instrument in a person’s lap and say, “Here – you play it”. As soon as they pluck or strum the strings, they hear beautiful sounds, regardless of their music talent (or lack thereof). People light up when they hear it. They feel empowered by playing it, and soothed by its lovely harmonies. And that’s important in healthcare where the typical patient feels anxious, lonely, bored or sometimes useless. Why is this instrument so successful? Weight: 4lb Tuned : pentatonically, with many other options available. 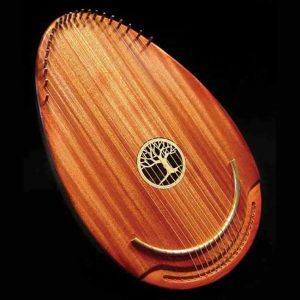 Made by Noteworthy Harps (Ohio, U.S.A.), in bubinga wood and fully levered with Loveland levers. Our shop, repair workshop and teaching studio are in the same building, so if you are travelling a long distance and can’t get to us during normal shop opening hours, please email or phone us, and we will happily open the shop for you outside these hours.